If you think about it, we all have a happy place...someplace that makes us smile and where we feel relaxed and comfortable. You probably have more than one happy place. I know I do, and funny enough, one of my happy places is an ice cream shop...Ghirardelli's, to be exact (it might seem that way but this is not an advertisement), though I generally feel pretty contented in most ice cream parlors. I love the warm feel of Ghirardelli's ice cream shops when I step in the door - the aroma of hot fudge mingled with warm waffle cones in the air, not to mention brightly wrapped chocolates everywhere I turn. It's my idea of heaven! Maybe another part of the appeal is I associate them with vacation. I tend to seek them out beforehand and if there's a Ghirardelli ice cream parlor somewhere we're vacationing (from San Francisco to Hawaii, Chicago to Florida, or Boston), I make a point to visit. My favorite thing to get at Ghirardelli's is their Treasure Island sundae, a classic brownie sundae with ice cream and hot fudge sauce. 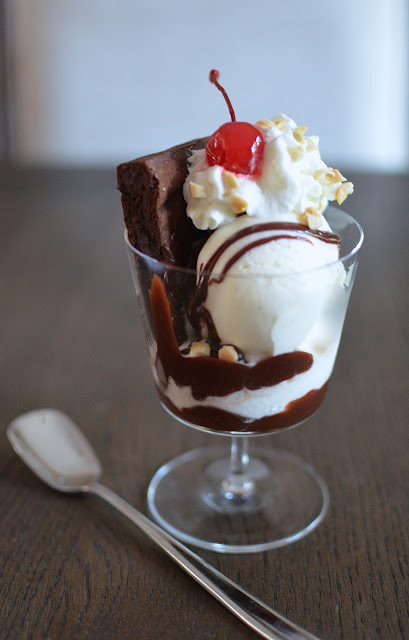 Ice cream and hot fudge sauce are my kryptonite...it's probably more about the hot fudge than even the ice cream but the two need each other, and what a perfect couple they make! If I take one bite, I will not be able to stop. Before I know it, I've eaten way more than I intended to, but I'm so happy. So I thought it would be fun to re-create my favorite sundae at home (especially since there isn't a Ghirardelli ice cream shop near where I live). I started with homemade vanilla bean ice cream, then I made Ghirardelli's hot fudge sauce (with my son), and finished it off with a batch of our favorite homemade cocoa brownies. I was excited to try the Ghirardelli hot fudge sauce, wondering how it would compare with the miraculous concoction we get at the ice cream shop. It isn't exactly the same as what you get fresh on site but I really like the discernible taste of the Ghirardelli 60% chocolate used in the sauce (it's one of my favorite chocolates to use for baking). I think it's much better than the jarred sauce you can buy from Ghirardelli. In comparison, I think the homemade sauce is thicker, somewhat grittier, sweeter than the free-flowing sauce you get from the shop. At a guess, I think that one involves cream whereas this recipe doesn't. Though the hot fudge sauce may not the stuff of dreams on its own per se, the combination of the ice cream, the hot fudge, and the brownie made for a swoon-worthy combination. My homespun version tasted so much like what we get at the Ghirardelli shop! I did feel transported to one of those tables at Ghirardelli and I was definitely in a happy place...my husband and son, eating with me, were in the same happy place right alongside me! 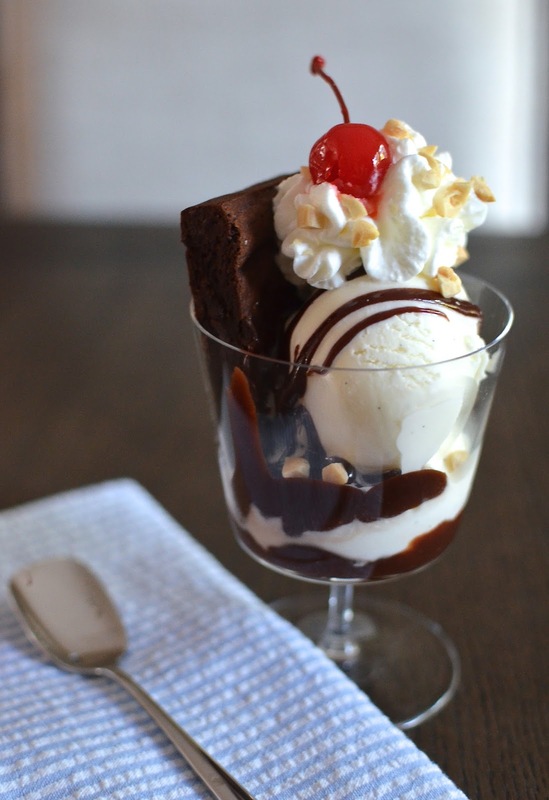 A squirt of whipped cream, a sprinkle of nuts, and a cherry on top makes a brownie sundae all that much more appealing! To transport myself to my "happy place", I needed 3 components to make this classic sundae: ice cream, hot fudge sauce, and brownies. Whipped cream, chopped nuts (I like peanuts) and maraschino cherries are optional but ever so pleasant. 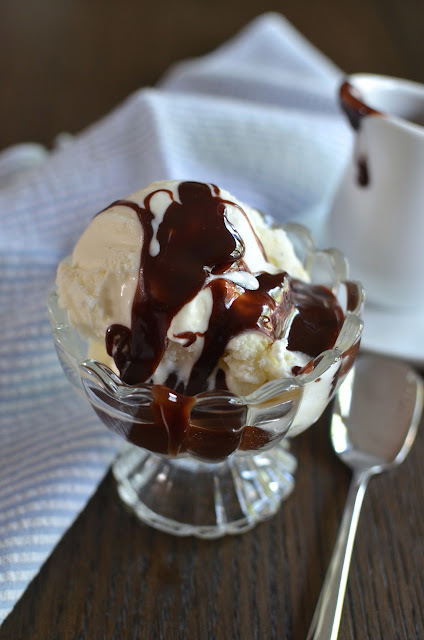 As for something new I had't made before, let's talk hot fudge sauce - Ghirardelli's published recipe, to be exact, which I thought appropriate given the sundae I was trying to replicate. 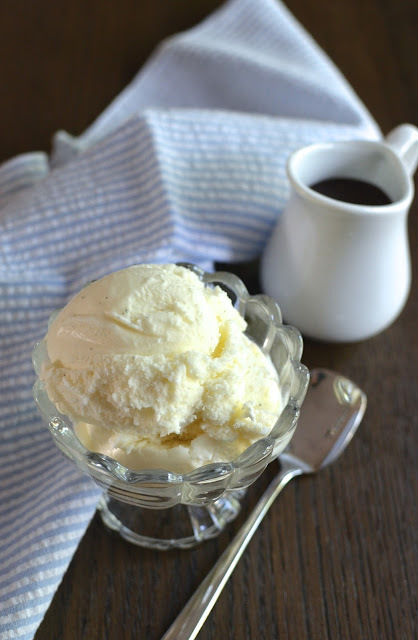 Of course, we wasted no time in trying out our hot fudge sauce on some vanilla ice cream. The sauce firms up as it hits the ice cream and it's chewy and messy in a very good way. 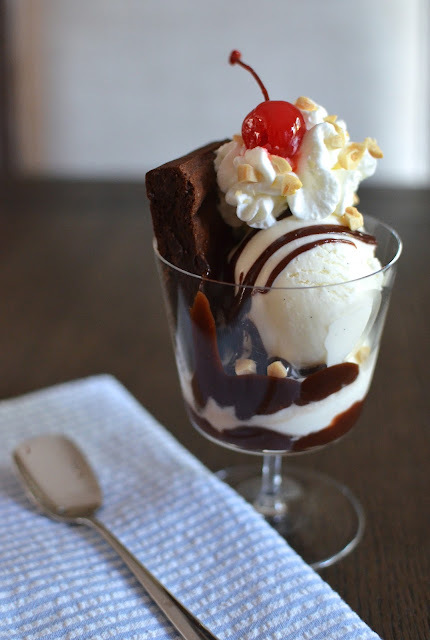 You simply can't beat putting the components together for the sundae - grab a glass, put a little hot fudge sauce at the bottom, and scoop some homemade vanilla ice cream on top. Slide a piece of fudgy chocolate chip brownie into one side of the glass and drizzle some more hot fudge sauce (be generous!) all around. Top the sundae with a squirt of whipped cream, a few chopped peanuts (or almonds) and plop that finishing maraschino cherry on top. Then, very quickly - dig in, relish it, and be happy!! Now if anyone feels like sharing, I'd love to know...what's one of your happy places? Place chocolate, butter, sugar, water, and corn syrup into a heavy-bottomed saucepan. Heat over medium-heat, whisking continuously, until chocolate and butter have melted and sugar is dissolved. Bring to a boil, then lower the heat and continue cooking (on a gentle boil), whisking frequently, for 10 minutes until sauce is thickened. Remove from the heat and stir in the vanilla extract. Store sauce, covered, in the refrigerator. To reheat, place sauce in a microwave-safe bowl and heat in the microwave in short increments (depending on how much sauce you're heating - start with just a 20 second spurt and stir frequently between heating until sauce is fluid). To assemble: Place a couple spoonfuls of hot fudge sauce into the bottom of a glass. Add a couple scoops of ice cream and tuck a brownie into one side of the glass. Drizzle the ice cream with more hot fudge sauce. Top with a squirt of whipped cream, sprinkle nuts over the whipped cream (if using), and plop a maraschino cherry on top. Place sundae onto a plate (because eating a sundae is always messy) and serve immediately with a spoon. Dig in and enjoy! I want to go to your happy place :-)) Can you take me along? This looks droolworthy, Monica. I love love Ghiradelli. This is one of my happy places. I am literally drooling :-) Thank you so much for sharing this recipe Monica. Have a great weekend. So glad to hear you share my passion for the place. I just love it there and we make a point to visit when we go on the road and there's one nearby. Such fun. You have a great weekend! First, I love the title of this post! And that story about when you visited Ghiradelli in San Fran made me smile!! haha I've been known to do things like that and scare the husband :) This sundae sounds soooo good! haha - thanks for that, Ashley. I have pics of my son and I chowing down on this big sundae...we were really hungry but seriously, who can resist hot fudge and ice cream, with a brownie! I can't. What a lovely recreation of Ghirardelli's Treasure Island sundae, Monica! In some ways, homemade versions of a store favorite are more special and you get to treat yourself in the comfort of your own home, while reminiscing of the SF Ghirardelli shop (I love that place! I recently visited there while on vacation in San Fran) (: Hope all is well with you! Oh yes now I'm going to be looking for a Ghirardelli shop next time I go on vacation! This sounds and looks completely wonderful! A satisfying and super happy treat! Have a great weekend Monica! Please do! I'm a walking advertisement here today! ; ) It started when we went to one on our honeymoon in Hawaii...since then, I just see it as a symbol of vacation and somewhere for a great treat. My son is happy it's one of my happy places and I think it's one of his, too. You enjoy the weekend...stay cool! Thanks! It's so easy to make since you don't need cream...I always have that 60% chocolate and butter at home so it could happen in a snap. Hope you enjoy a big ice cream sundae real soon! We're still enjoying the chocolate sauce. : ) Hope you have a great weekend! Aaw I love your happy place! :) My happy place always involves ice cream too! So cute about you and your son :) We loved the Ghirardelli ice cream shop in San Fran when we visited too! This pretty sundae looks like the perfect summer treat! I love ice cream too! What sweet memories you have and the new ones that you are creating. So nice that you and your son made the sauce together. I LOVE your happy place. It'll bring a smile on everyone's faces. What an awesome recipe! Quick and just DIVINE! Hi Monica! Definitely a special dessert from your happy place - it looks and sounds dreamy! I have never made a hot fudge sauce before and this sounds divine. Can you make it in a large batch, refrigerate then re-heat for the ice cream do you think? A lot of work has gone into this dish - homemade ice cream and those brownies...our family favourites now thanks to you! I hope your summer is going well so far. Best wishes! Ha ha! I love those special trip memories, and it sounds like your San Francisco ice cream moment was one of those! Ice cream with chocolate fudge sauce is divine, and homemade is always best. We have made pilgrimages to far too many Ghirardelli ice cream shops...and enjoyed each very much! It's one of the great things about traveling, as you know. I love your descriptions of that chocolate sauce, Monica! I think that sundae would be my happy place too. It sounds like the Ghirardelli shops are one of a kind. Your hot fudge sauce certainly hit my happy button too, Monica! I love ice cream, It is my favorite and I always eat it specially in summer. Here is the mix up of lots of flavor ice cream but I love vanilla. Buy online the best quality Ghirardelli Chocolate Sauce at reasonable price.